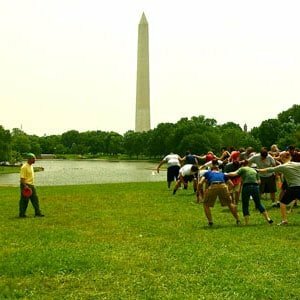 Hold your team building event either off-site at a local park. The group should not have to travel too far to get to the venue, and the venue should not cost an arm and a leg before you’ve even booked a team building facilitator. For groups in Washington DC, Rock Creek Park is one of our favorite event locations and only costs $7 to reserve a pavilion! Be realistic about your team building goals. Are you looking for a stand-alone event that will raise morale and enhance team spirit, or do you need something a little more focused, with specific goals and outcomes. If the focus is fun, check out our Adventure Team Challenge – a rotational team building event for groups on a budget. Combine your teambuilder with another activity. Maybe you just can’t afford to go off-site, and you prefer to have something brought to your location as part of a strategic planning session, or other meeting. Facilitated team building can provide a quick energizer for your team, and then you can “get back to work.” If you need to keep it quick and simple, check out our Portable Team Challenge – a facilitated team building program that can be brought to a conference room near you. Team building on a budget is not necessarily a bad thing. If you simplify and focus on the key necessities, you can still reap the benefits of a high quality team building experience.